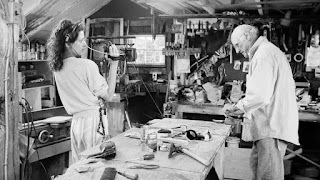 Directed by Rebecca Miller, Arthur Miller: Writer is a documentary film about the life of the famed playwright through many archival interviews and rare home movies shot by Miller’s daughter Rebecca. The film explores Miller’s life as well as his marriages to different women including Marilyn Monroe and photographer Inge Morath who is Rebecca’s mother as well as look into their family life. The result is a compelling and evocative film from Rebecca Miller. Considered one of the great playwrights of the 20th Century, Arthur Miller was a figure that made an impact on American culture with his plays during the post-war era of the 20th Century. While it may have brought him fame and fortune, he also deal with scrutiny over supposed ties with communists during the Red Scare as well as being in a very publicized marriage to actress Marilyn Monroe from 1956 to 1961. For much of his time being famous and revered by many, Miller remained a man who was quite humble due to his upbringing as he would also choose to live much of his life in his home in Connecticut with his family doing all sorts of things. During this time in the 1980s to the early 2000s, Miller was filmed by his daughter Rebecca for interviews about his life that include conversations with his two siblings and his third wife Inge Morath. The film is told in six chapters as it relates to Miller’s early life, his success with his plays, his three marriages including his second to Monroe, the Red Scare where he was accused of being a communist, and the period in the 1970s and 1980s where he felt out of place with the world of plays. Yet, much of the footage of Miller being interviewed is filmed by Rebecca who would appear in the camera as she also talks to her uncle Kermit and the actress Joan Copeland who is Rebecca’s aunt. Also interviewed in the film through more recent periods just years after her father’s death in 2005 are Rebecca’s older half-brother Robert, playwright Tony Kushner, and filmmaker Mike Nichols just before his death in 2014 as they’re filmed by Miller and cinematographer Ellen Kuras. Another half-sibling interviewed is Jane who does an audio interview as she and Robert talk about their father’s first marriage to their mother Mary Slattery and some of the regrets their father had over their dissolution. Robert also talked about the time his father was married to Monroe where she was good to Robert and Jane but they both knew how fragile Monroe was as a person. It was during the production of The Misfits that starred Monroe and was written by Miller is where Miller first met the German-born photographer Morath who would later become his third wife though they only began a relationship just after Miller and Monroe had officially split. Rebecca would make mention of her younger brother Daniel who was born with Down syndrome as she doesn’t have him filmed nor use any photographs of him out of respect for his privacy as she also mentions that she never had the chance to film her father about Daniel whom he and Inge rarely talked about. Yet, Rebecca would also have her father talk about his falling out with filmmaker Elia Kazan over Kazan testifying to congress during the Red Scare as he felt Kazan had been pressured to name names in order to maintain his career. While Miller admitted to having interest in Marxism, he ended up not going along with it as he felt the whole Red Scare was about people becoming liberal against a very conservative period in American history which is partially why he wrote The Crucible. Much of Rebecca Miller’s direction is straightforward with a lot of the home movies that she cultivated including the interviews and home movies she filmed from the 1980s to the 2000s that include a few she shot with cinematographer Ellen Kuras. Editor David Bartner would cultivate a lot of the home footage including the rare home movies shot by Arthur Miller himself as well as news footage of Miller during the late 1940s to the 2000s including footage of his plays and film contributions. Sound designer Ruy Garcia would compile all of the audio including rare audio interviews with Miller and his daughter Jane as well as audio from others about Miller’s life including his troubling period in the 1970s where he felt out of place from the world as he admitted having no clue about the counterculture as he preferred to follow his own muse. The film’s soundtrack largely consists of jazz music as it play into the world that Miller was including bits of rock as it relates to the late 1960s. Arthur Miller: Writer is a marvelous film from Rebecca Miller. Not only is it a fascinating portrait of a revered man by his daughter but also a film that allows the man to be seen as someone who is human that has a broad view of the world. Even as it’s a film that allows Miller to show her father as someone that loved life no matter how bad things can be and the mistakes he’s made as a person. In the end, Arthur Miller: Writer is a remarkable film from Rebecca Miller. I was glad to learn about Andre the Giant, but this is the one I really came back for when I saw this on your site yesterday (I read your posts but can't leave comments while at work - it blocks the google comments). This guy had such a life and career, but I can see an inexperienced director getting caught up in the wrong things. It's cool that there's so much home footage included. @assholeswatchingmovies.com-In the hands of another filmmaker, it would've been a typical documentary about this and that. Yet, the film was made by someone who didn't just knew him but had a connection with him that was deep and who better to do that than his own daughter. It was great that she had the access to all of that footage and even filmed it just as she was beginning her foray into filmmaking.